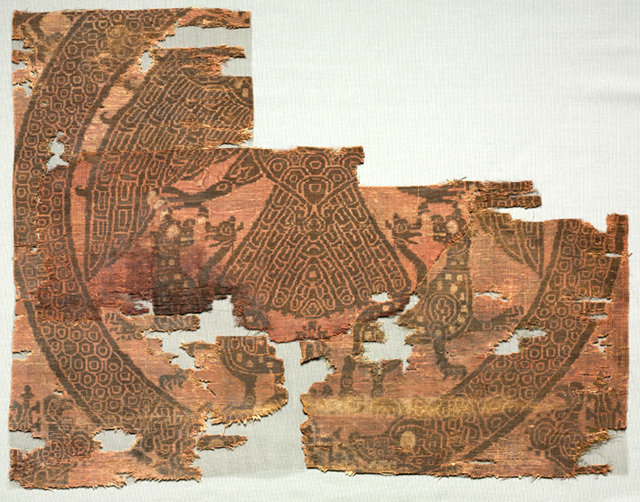 When the main altar of the Benedictine abbey church of St. Peter in Salzburg was torn down in 1606 to make place for a new one, this fragment of a brocaded silk was among the precious textiles reportedly found in the sepulchrum, or altar tomb, of St. Amandus. According to a local tradition, the relics of St. Amandus had been brought to Salzburg from Worms by the city's first bishop and abbot of St. Peter's, St. Rupert (d. 718). The presence and veneration of the relics of St. Amandus at St. Peter's, however, can be traced back only to the episcopate of Archbishop Arno (785–821), who served as abbot of the Monastery of St. Amand at Elnon (Flanders) from 782 until his appointment as bishop of Salzburg in 785. It is therefore likely that the relics of the second-most important saint of the abbey church of St. Peter's are those of St. Amandus of Maastricht (d. 679), the "Apostle of Flanders," rather than St. Amandus of Worms (d. 659). On which occasion the relics of St. Amandus were wrapped in the precious silk shroud, found during the early seventeenth-century renovation of the main altar, is difficult to determine with certainty. An opening of the tomb of St. Amandus is first recorded for 1443. However, it is more likely that the shrine was already opened under Abbot Balderich (r. 1125–47), who rebuilt the St. Peter's Church from its foundations after a devastating fire in 1127. The practice of wrapping the bodily remains of Christian saints in precious textiles, often imported from the eastern Mediterranean, the Near East, Spain, or Sicily, is well attested from at least the eleventh century onward. The decoration of this gold-brocaded reddish pink silk, which consists of an imposing double-headed eagle attacking two white-flecked panthers with dragon-head tails enclosed within two half-circles that terminate in dragon-heads, points toward an origin in the eastern Mediterranean or, more likely, the Islamic Near East.